The Pound resumes its rally as optimism related to Brexit pushes the currency higher. This is also coupled with the market digesting this month's positive economic data released from the U.K with GDP printing at 0.3% compared to the expected 0.2% and wage growth printing at 2.6% compared to the expected 2.4%. Additionally, Sterling is not facing any pressure from the greenback as investors await any development in the trade dispute between the U.S and China. For today, investors need to watch for any updates relating to both Brexit and the trade war between the U.S and China as they will be the major drivers of the pair. As optimism surrounding Brexit remains, the pair continues to rise. This time, the Pound was able to break above the 1.30919 resistance level which was preceded by a bullish rejection of the 13-period moving average. 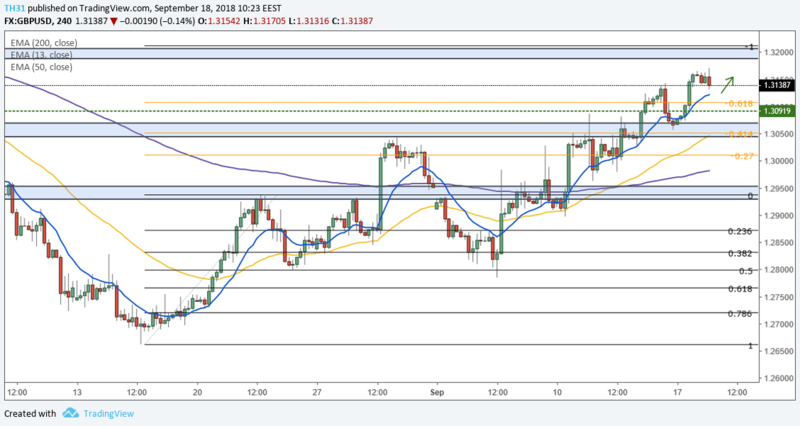 The break above the 1.30919 resistance level paves the way for a rise all the way towards the key 1.32000 level.